German Shepherd Rescue Victoria (GSRV) was founded by Ange McLaren in 2014 after she took on and rehabilitated Georgie. As Ange describes it, Georgie was a psychological and physical wreck. She was 21kg, her teeth were a mess, her hair was brittle; she was jumping at shadows and her reaction mode was set at aggression. It took Ange many months of patient training, and positive reinforcement to bring her around, but the effort was magnificently rewarded. Georgie is now a healthy 32kg and one of the happiest and most friendly dogs you’d come across. The experience prompted Ange to form GSRV as a registered charity of committed volunteers who are passionate about the rescue, rehabilitation and rehoming of this majestic and loyal breed. With a Facebook following of over 25,000 they have been able to fund an annual “salvation” of over 150 shepherds. The organisation boasts a dedicated army of volunteers who, driven by their love of the Deutscher Schäferhund, combine their efforts to make sure GSRV runs smoothly and efficiently. And an army it is; frontline transporters, foster carers, trainers and behaviourists to backroom administrators, fundraisers and donors, all play their role. 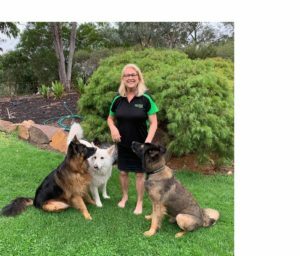 LifeWise caught up with GSRV Vice President, Trisha Pratt, at her stunning Warrandyte property, where we learnt of the rehabilitation of Rusty. A more harrowing tale you could not imagine, and we warn you, it’s not a tale for the faint hearted. We’d like to pass on this story as an indication of the lengths to which rescue groups will go, to bring an animal back from the brink of oblivion. In February, GSRV received an urgent call for help from Project Hope Horse Welfare Victoria; they had found a German Shepherd abandoned at a rural property. This boy had apparently spent the last three years living in a filthy dog run. Recently, his owner had gone into care, and the only interactions he was having was when the kind neighbours went to feed him. Given the description GSRV were given of the situation, they knew that time was of the essence for poor Rusty, and agreed to collect him that day. Finding a foster carer for this complicated rehabilitation was difficult, so fellow rescuers, Paws2Luv, saved the day by stepping in at the last minute to take care of him, until a suitable carer was found. On arrival, GSRV found Rusty in terrible condition. The smell coming from this poor boy was overwhelming; he was living in filth, locked in a cage, greasy and matted, and extremely overweight. When he was first let out of the dog run, he ran round and round in circles, biting his tail, unsure of what to do. It became clear that he needed immediate medical attention, so he was driven straight to Wantirna Veterinary Clinic. An exhausted Nurse Emma from Wantirna Vet Clinic. Trisha wondered what on earth she had gotten herself into, but knew that GSRV needed to get to work. Rusty was so overweight – 60kg – and so weak in the legs from lack of exercise, he fell over when he tried to get down from the transport vehicle. The Wantirna Vet Clinic, of which Trisha was happy to say, had assisted before, jumped in to help Rusty. The stench from the farm enclosure was vile and embedded in Rusty’s fur. They had to clear the surgery before anesthetising and shaving him back to the skin. What was underneath was microchipped pedigree longhaired German shepherd, with beautiful clean skin and a solid frame. However, there was still the obsessive-compulsive disorder to deal with. He was manic; tipping over water bowls, tearing up bedding. Pat, from Paws of Love, found she had to sit with him while he ate; walk away, and he’d tip the bowl over. “Once some space opened up we took him back”, Trisha said. “He pushed us to the edge a few times, I can tell you. We started him on LifeWise at this stage. After 6 weeks we took him to the Vet for a check-up and to have him de-sexed. His blood levels were perfect and he had calmed down to the point that he was now comfortable with other dogs. It just goes to show the importance of TLC, and a balanced diet”. From freshly shaven to his current coat, Rusty’s recovery is well underway. Funding is problematic for all rescues, and it’s no different for GSRV. 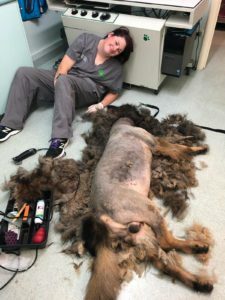 “Every little bit helps” says Trisha, “we have some supporters who make monthly contributions, and others that generously chip in during a particular emergency, such as Jaegar’s case. We even have one anonymous contributor who makes a periodic $1,000 gift. The frustrating thing there is, we can’t even thank them! There’s also those commercial enterprises who generously donate their professional services or goods. But without doubt, it’s the unsung and unpaid network of shepherd devotees who are the assessors, carers, and foster homes, that deserve the most praise. Without these volunteers, we’d be at a loss to deliver the service that re-homes over 150 dogs each year”. This is an amazing figure, considering they have 25 foster carers on the books, only 7-8 who would have space at any given time. Allendale Kennels was one Trisha specifically pointed out for special mention. “They’ll take dogs at no cost for short term kennelling on very short notice; they’ve been amazing”. Dogs find their way to GSRV in various ways. “Lort Smith, The Lost Dogs’ Home, RSCPA and rural pounds are all regular sources, but we also get many calls from people who ‘bought this puppy and now it’s jumping all over the kids’”. Trisha disguised her feelings on this, but it’s a long weeping sore with animal lovers in and out of the rescue sector. German Shepherds are also popular with “Puppy Farmers”, and the RSPCA & local council raids are also a source of shepherds requiring rescue and rehabilitation. One such “bust” saw at least 22 “breeding dogs” seized by Council – 14 of those dogs were German Shepherds, of which GSRV took 9 of them into care in one day. Animal hoarders are a submerged element of animal mistreatment. Trisha told of one raid she attended in which GSRV took a female shepherd, with seven 9-day old pups, into care. Whilst the pups found wonderful homes, the matter ended sadly for Mum, when after seven weeks, she became paralysed– a result of excessive, over breeding, and with no hope of any quality of life, and had to be euthanised”. Whilst times like this are extremely distressing, the positive outcomes most definitely outweigh the negative. Regular updates and photos from the wonderful forever homes melt the hearts of all those at GSRV. Seeing the enormous changes in the lives of so many of their rescue dogs, is what drives them to continue their work each and every day. Rusty well on his way to recovery and finding his furever home. 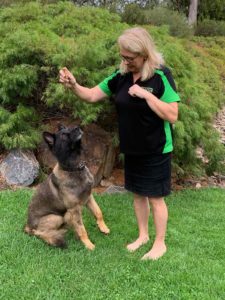 German Shepherd Rescue Victoria is one of two GSD specific rescues operating in this state, but rescue groups also operate out of NSW, Queensland, Tasmania and South Australia.